In my continuing research for my trip planning I have focused on shelter. Now, I am by no means even slightly educated when it comes to tents. Anything camping really. So my research, criteria, and decisions were based on talking with more knowledgeable friends, taking note of their criteria, then picking out the most important features that appealed to me. Shelter, along with food and water, is an important aspect of survival, so I figured I better spend some time researching tents. I actually started researching tents awhile back, and come across a couple I thought fit the bill. Over the last week, I have continued to read sites, reviews, and peoples personal experiences. I decided to focus on what other Motorcycle adventurers have had good experiences with. Unlike backpackers, I am not in need of something of the Ultralight category, but at the same time, I do not want something that is going to be a pain to setup, nor extremely heavy that if I decide to do a weekend trip up into the local mountains, and backpack in, that it will be to much of a burden for a short hike. So I started off with thinking of the criteria that was most important to me in a tent. The first 2, are both by the Manufacture MSR, a local Northwest Company based out of Seattle, Washington. This 2 Person, 3.5 season tent incorporates a 17.5sqft vestibule and only weighing in at only 3lbs 11oz, it is one of the lightest that I found in my research that met my criteria. Due to its 3.5 season design, it has mesh on the upper portions of it for venting, creating exceptional privacy, and heat retention for those cooler nights and a quick freestanding setup. With its domed design and 40 inch vertical center, it gives amble head room to sit up and dress, and provides a modest 44cu. ft. of volume. The next tent up from MSR was the Mo Room 2P. The Mo Room 2P stood out to me for several factors. First, it had the highest Verticle Center of any of the tents I researched. Coupled with this rectangular, almost verticle walled dome design, it meant that it incorporated a larger square footage that one could sit comfortable without the roof of the tent coming down to sharply. Because of this radical design, it almost doubles the usable volume of the Hubba Hubba with an incredible freestanding 80cu. ft.
Secondly, it had one of the largest vestibule spaces of all of the tents I researched, coming in at 18.5sqft. Much like the Hubba Hubba HP, this tent, incorporates mesh in the roof of the tent only, has 2 doors, and is freestanding. With all of this extra space and features, comes the extra added weight of 6lbs 12oz. Almost exactly3lbs more than the Hubba Hubba HP. 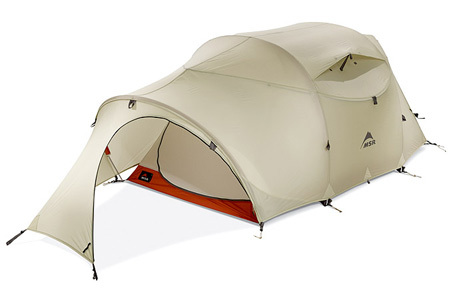 The Spire 2.1 was the only true 4 season tent that I looked at. It caught my eye from a couple of reviews. Of all of the tents I picked out to do more research on, this one had the least vestibule space at 11sq. ft.
Due to it being a 4 season tent, it was designed without much venting. This could be a problem with warmer days, but would provide the best heat retention for those cooler days. Just like the others I looked at, it has 2 doors for ease of getting out of the tent. With packed weight of 4lbs 11oz. It also came in as one of the lighter tents I looked at, at 1lb more than the Hubba Hubba HP and 2lbs less than the Mo Room 2P. The Aeolos 2P was by far the largest of the tents. With its 35sq ft. of tent floor space and 19sq ft. of vestibule space, this tent had lots of room. It also, was the least expensive of all of the tents, which put it high up on the list. Weighing in at 5lbs 12oz, it is 1lb less than the Mo Room, making it the 3rd heaviest of the bunch. Like the others, it provided a 2 door design, making getting out of the tent easy on the travelers. This tent, however, had a couple problems from what I could find out from my research. For starters, the majority of the tent is mesh. So privacy, without the fly, is 0. It also was the only tent that wasn’t freestanding on its own. While that wasn’t a major criteria for me, it is worth noting. But the fact was, it was a large tent with lots of space, so it was worth looking into more. So with 4 incredible tents picked out, I continued my research. Reading reviews, reading peoples own personal experiences with them, and surfing the world wide web for the best deal on each of the tents, as well as researching the outfitters for customer satisfaction. After some time, and research and more time, and back and forth, I narrowed it down to 2 tents. Both tents were from the same company, MSR. Here we had the 2 extremes. The heaviest of the bunch, and the lightest of the bunch. Both had ample vestibule space, both were free standing, and both provided privacy. The deciding factor finally came down to 1 important feature. The Mo Room 2, provided the most interior space between the two. It also provided the most vertical space of all of the tents, resulting in the most usable cubic footage. Another deciding factor was the actual volume of the vestibule space. The Mo Room provided the most volume of any of the tents with over 29cu ft of volume, 20 of that being at the front, and at full height. This would provide a very well protected area to cook meals in adverse weather. At the heaviest of the tents, I felt the features far outweighed the the 3 extra pounds over the Hubba Hubba HP, making it my final choice. I was able to secure this tent, from Sunny Sports outfitters for $225 shipped. It also ended up being the best deal I could find. I can’t wait to put this tent to use out in the world across the Northern American Continent, and provide my own personal review on this tent.